"Platoro" is the blending of two Spanish words - "Plata" silver and "Oro" gold. 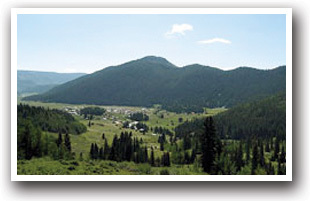 Near the Conejos Headwaters, the 1870's brought gold and silver to Platoro, and the short boom in 1913 gave Platoro a name. Without a road, burro trains transported the ore from the city. The pony express brought the mail during the summer, and dog sleds brought mail during the winter. Discovered in the 1960s, the Mammoth mine has proven to be the largest producing ore mine in the area, continuing to produce today. 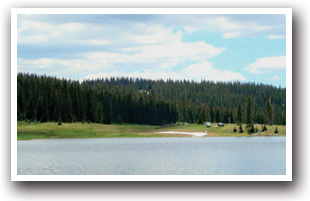 The Platoro Reservoir is a wonderful fishing hole for brown, rainbow (stocked in summer) and some Kokanee. This 990 acre Reservoir is the highest man made lake in North America. Boat rentals are available. No matter the river or lake, fishermen will always have something biting their line in the Conejos River Canyon area. Platoro is off Highway 160 between South Fork and Antonito on Road 380.